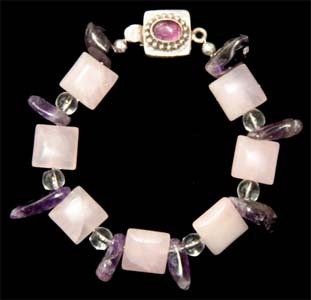 Handmade with Amethyst, Rose Quartz and Crystal Quartz, this bracelet helps relieve stress for the wearer. Amethyst is considered one of the most effective crystals for any kind of healing work. It is potent for ailments of both mind and body. Particularly helpful for addictions to alcohol or food. Prevents insomnia and soothes headaches. Also good to maintain blood sugar balance so is very helpful for diabetics. Rose Quartz eases pain and tension especially from stress, fear, anger or grief. Excellent for bringing peace. Crystal Quartz helps amplify the other stones and stores energy. It is particularly useful for meditation to help align with one's higher self. It strengthens and cleanses while protecting. It purifies air. Available in 7 or 8-inch sizes, the bracelet is made with a sterling silver Bali Amethyst clasp and comes in a gift box with a descriptive card.